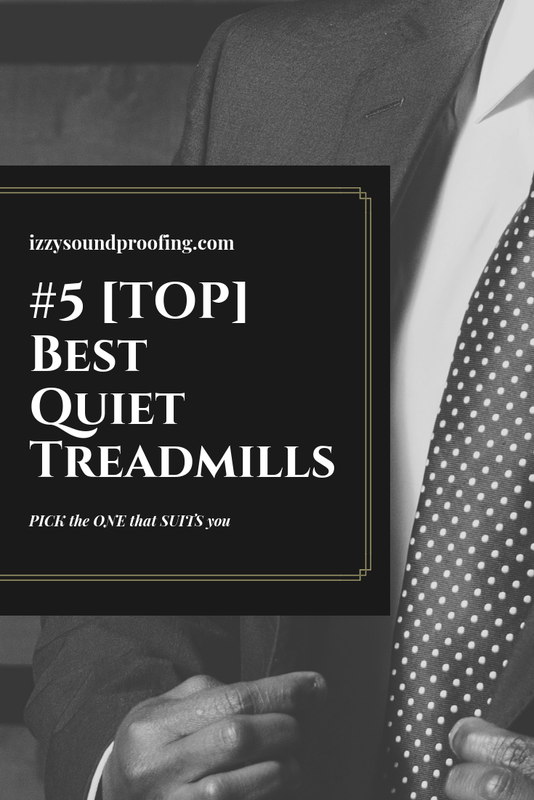 Are you looking for a quiet treadmill? If yes, then you have definitely landed on the correct post. We will be discussing some of the best treadmills available in the market. If you are tight on budget, then don't worry, most of our readers belong to the same group. In most of the cases, the costliest products definitely have the best features but we will be reviewing the products which can be used by the masses as well as the classes. Though most of our reviewing products lie in the budget-friendly domain still we review a few products that are superlative. In today's world, a treadmill isn't luxury but the need of an individual. 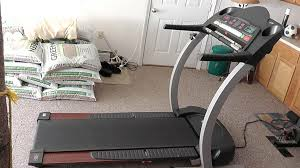 Having a treadmill at home is a great way of getting your cardio done but at the same time, it is important that the treadmill is quite enough to let the family members sleep undisturbed. If you are using a treadmill which is producing unwanted noise, then you can solve it in two ways. 1. Soundproof the treadmill area and isolate it from the rest of the room. 2. Buy a quiet treadmill. In this post, we will discuss both the option. All the treadmills that we have picked for review are either used by our team or clients. When you are planning to buy a quiet treadmill, you need to look for certain decision making parameters. We will discuss these parameters in detail in this post, so that in future also, you can independently evaluate the potential of a treadmill. At times, a noisy treadmill can be annoying and also, curb you from keeping up with your fitness goals. The worst part is you might end up disturbing others while exercising. Running/Walking: If you are looking for a treadmill that is great for running, then you need to look for a treadmill with advanced features. On the other hand, if you are planning to only walk on the treadmill, then you can choose the one with minimal options. Budget: Treadmills comes in a wide range of budget. Deciding on the budget can help you to minimize the confusion and thus, you can narrow down the available options. As a result, taking the final decision on the treadmill can be less time-consuming. Control: When you are planning to you a treadmill, you should definitely look for the control. According to me, it's perhaps the most important thing that you should really care about. You should check whether the display and the control of the treadmill are feasible for you or NOT. Another important thing that you need to look for is the entire operation should be hassle-free. When I planned to buy the treadmill, I read the users review and also tried a couple of treadmills before buying the one that caters to all my needs. I will recommend you to consider the design of the side strips. You also need to see that you are comfortable with the inclination of the treadmills. I wasn't comfortable with the inclination of few of the treadmills as it was putting a lot of pressure on my joints. Space: Yet another very important parameter that you need to consider while buying a treadmill. I will suggest you measure the available space at your home and jot it down. It's always good to buy a treadmill that suits the available space rather than buying an oversized treadmill. There is certainly no doubt that there are numerous treadmills available in the market. However, the treadmills that made to our list are of high quality and also possess features like quite motor, durable, value for money. The Sole Fitness F85 Folding Treadmill provides you an exceptional 22" wide running surface area. It also supports weight up to 400 lbs. The treadmill comes with an option of the auto program as well as user-customized workouts. Depending upon your requirement, you can select from six auto programs and two user customized programs. In layman language, it is fully equipped with all the customization, including two separate heart rate control programs. The best thing about the heart rate control program is that it automatically calculates your recommended target range based on your age. The treadmill has a vibrant display board which provides you the information related to speed, incline, distance traveled, time, calories, pulse, and pace. To gain momentum and improve your concentration, the console comes with a built-in speaker which allows you to hook up any MP3, iPod etc for a great listening experience. It's always good to fulfill your fitness goal but at the same time, you should keep in mind that others shouldn't get disturbed. Keeping this point in point, F85 comes with a powerful 4.0 CHP continuous duty motor, that is, it gives you feasibility to work out at a very high speed with almost zero noise. The thing that really attracts my attention is the EasyAssist feature, that is, it helps you to fold the machine in a very easy and feasible way. I would also like to throw some light on the fact that you can increase the intensity of your workout by increasing the inclination up to 15%. You also have the option to save up to two profiles. If we talk about the user's review, then I can assure you that the reviews are mind-boggling and most importantly matches the user expectations. The user-friendly interface coupled with the latest technology is bound to make the difference. This noise-free treadmill is definitely a value for money product. If you are looking for a treadmill that has amazing workout programs, then Sole Fitness F85 Folding Treadmill is a great choice. Personally, I literally love the speed range of 0.5 to 12 MPH speed, two-ply belt, and pulse grip. The Proform 505 CST Treadmill comes with a large LCD screen that helps you to monitor your time add up, calorie burn, heart rate, and speed. It also comes with the fully loaded professional training program that can help you to reach your goal by performing the challenging workout. 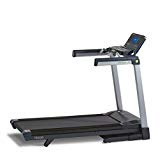 If you love running at 8 MPH and above, then this treadmill can help you to achieve a top speed of 10 MPH with the help of faster flywheel gear ratio and bigger motor size. It also comes with a QuickSpeed button that can help you to instantly adjust your intensity and thus, help you to stay focused throughout your workout. I will suggest you, buy this treadmill ONLY if you have enough space in your room to place this 55-inches length roomy deck. In case you have a decent space in your room, then you can use this 55 inches long and 20 inches wider treadmill. The width gives your upper body an extra elbow room. The Proform 505 CST Treadmill has a unique testing methodology. The treadmill belts are tested for a million cycles at double the user weight before release. Personally, I feel that if you are using this treadmill for walking or running, you will definitely feel less stress on your joints, feet, ankles, knees, and hips. As a result, you can enjoy a longer workout time and less recovery time. If you have been working out from some time, then you will definitely agree with the fact that music plays a crucial role in increasing the intensity of the workout. I personally increase or decrease the pace to match the tempo of the music. This treadmill has a space saver design. You can easily fold up the treadmill when you are done with the workout. Wait, I forget to mention about the EKG Heart monitor, the inbuilt two hand grip sensors, it helps you to see your heartbeat in a couple of seconds at any point of the training. 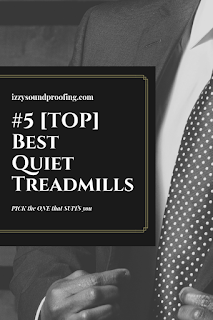 Last but not least, the treadmill is NOT particularly noisy and this feature makes it a great choice under quiet treadmill for apartment category. Trust me, LifeSpan TR1200-DT5 Treadmill Desk can be a suitable option, if you are workaholic. This treadmill comes with an inbuilt desktop that serves your two purposes simultaneously, that is, you can work and exercise together. I suggest this treadmill to mostly IT person or someone who spend most of the time on the laptop. 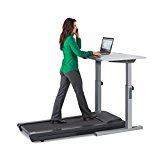 You can use the inbuilt desk to keep your laptop and at the same time, you can do your cardio. It also has a manual height-adjustable standing desk. The whisper quiet 2.25 HP electric motor helps the treadmill to perform well with minimal noise pollution. It has an inbuilt console that can help you to know about the distance traveled, calories burned, walk and run time, and step count. The treadmill gives you an option to adjust belt speed between 0.4 and 4 MPH. The thing that I liked the most about this treadmill is its compatibility with popular fitness apps such as Google Fit and Apple Health. 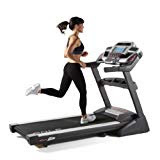 If you are socially active on Facebook and Twitter, then this treadmill can be your first choice as it allows you to share your progress on facebook and twitter. If you are very specific about the colors, then there is a piece of good news for you, it comes with two frame colors and four desktop colors that can help you to select the one that matches your interiors. I will recommend this treadmill to those who are looking for a suitable option for the office. To prevent the office productivity from getting impacted, it comes with six impact-absorbing compression shocks. To keep you focused on your work, it comes with a high-quality component that suppresses the mechanical noises as well as subdues vibrations. The Horizon Fitness Elite T7 Fitness is a unique treadmill that will encourage the athlete inside you. The premium construction and superlative feature help you to stay motivated and train hard. Personally, I haven't used this treadmill but the company claims that Infinity belt never needs lubrication no matter how much you run or walk. The ViaFit connected technology sends the workout from the treadmill to fitness app and tools. The treadmill is powered by 2.75 horsepower motor that doesn't create any noise. It also includes a lifetime motor warranty and the hydraulic folding system makes it easy to store. It also includes a FREE polar chest strap that helps you in monitoring your heart rate. To differentiate it from the competitors, the Horizon fitness elite treadmill comes with a unique option of Passport Video. It connects your machine to the television over Wi-Fi displaying beautiful outdoor scenery. These sceneries keep on changing with time. Last but not least, all these features make the treadmill a perfect choice for the modern lifestyle. If you love natural beauty and traveling fascinate you, then you should definitely try this product. Trust me, it will be worth the money spend. Before we move to the last product in the review list, allow us to share some of the mind-boggling product review posts from this blog. This is the last product in the best quiet treadmills review list. Lifespan TR3000i Treadmill comes with a 2.75 hp continuous duty motor which is known as a long-lasting, high-quality motor. It provides 20 inches by 56-inches running surface which is ample for walking, jogging or running. Similar to other treadmills, it also has several workout programs that will help you in losing weight, monitoring heartbeat, sports training etc. It has an inbuilt LCD display that will help you to monitor your progress. You can also transfer the data to your smartphone, laptop using the USB connection option. The interface is user-friendly and comes with a folding feature which helps to use it at home and office. The treadmill is compatible with MP3 and iPod. Finally, it's a great option for someone who is tight on the budget and still wants a reliable as well as a durable treadmill. Needless to say, it comes with all the basic features necessary for a good treadmill and will definitely give you a mind-boggling workout experience. I will recommend you the Sole Fitness F85 Folding Treadmill. Before starting my workout on this treadmill, I have tried quite a few other options as well. It is a perfect treadmill for the entire family member and is also, a feasible option for the office. Personally, I was looking for a treadmill which has some great workout programs and at the same time, has a minimal or almost no noise. I can assure you Sole Fitness treadmill will match your expectation. It comes with a powerful 4.0 CHP duty motor, inclination up to 15%, a reversible deck, 10 workout programs, and many more features. Needless to say, it provides amazing comfort for flex and workout. However, other options are as good as this treadmill, the only thing that really matters is your requirement. Each treadmill mentioned in this review posts are definitely a superlative one in its sense. The customer reviews and ratings for these treadmills are mind-boggling and the best thing about these treadmills is that it matches the end customer expectation.